In the fourth of a series of undercover investigative videos, a Planned Parenthood worker casually sifts through the “war-torn” remains of an aborted fetus, looking for pieces to sell. “It’s a baby,” she jokes. “Another boy,” she adds, picking up a severed leg. I have been praying, and hoping, and waiting, and crying out to God for a child for almost two years now. Going through fertility issues is one of the most stressful and heart-wrenching experiences I’ve had to deal with in my short life of 30 years thus far. Nicole and I had a miscarriage about a year and a half ago, and have been desperately trying to get pregnant again ever since, with no luck as of yet. If anyone out there reads this and is considering abortion, I will take your baby. My wife and I will gladly take all your babies! I’m completely serious. If you are pregnant and don’t want your child, we will. It’s not a fetus. It’s a blessing. Life matters. After months of prayer and discernment, Nicole and I have chosen to take action. This past week we began looking into the process of adoption. We did some research and reached out to a number of adoption agencies. Though it may be difficult, we are hoping and looking for an opportunity to adopt a baby who would otherwise be aborted. In the past, we’ve seen people standing outside an abortion clinic in Lexington with signs and information reaching out to people. Two weeks ago, Nicole stopped by when she was in the area and talked to them. She learned that this was the only abortion clinic in Lexington and is open on Thursday and Friday mornings, during which all they do is abortions, both by appointment and walk-in. So we decided to step out in faith. We made our own signs and this morning we went out there to pray for and reach out to people with God’s love. That day, as they stood outside the abortion facility, Kevin and Nicole were mocked and largely ignored. But they didn’t give up. 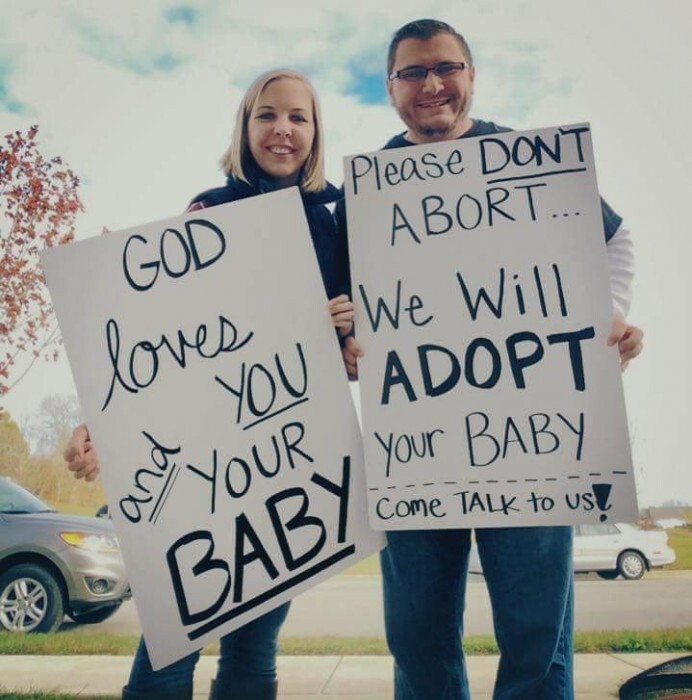 They went home and shared the picture on Facebook, along with their dream to adopt. Their story instantly resonated with others. Soon tens of thousands of people had shared their post. Messages began pouring in. We are still looking for the right situation for God to use us to save the life of a child who would otherwise be aborted, and we would love to be able to save two if God provides that! Women continue to message us and we are looking at each one as an opportunity to save a life, either through personally adopting their child or through connecting them with an adoption agency locally. We know it’s a long process and a lot can change over time, but we hope to find our two soon and begin that long journey together! Our prayer is to completely overwhelm adoption agencies nationwide with an influx of birth mothers who have seen our message and have chosen life! So this just happened. Kevin and I are working at Starbucks and this woman just recognized him from his post about adoption. She just said that another woman is not going to get an abortion because of their post and wants to give the baby to this particular woman and her husband!!! Kevin and Nicole are still looking for an opportunity to adopt, and have also set up a GoFundMe account to help with the expenses of adoption.